We are going to help with Hurricane Relief - plan on an adult work trip this fall. At the January meeting of the Positively Green Team, a large group of First Congregational Green Team members and representatives from environmental groups shared a host of exciting ideas. The Green Team is gathering again in the drawing room this Sunday, February 4 , following the worship service. We'll discuss concrete actions we can take. There's room in this movement for everyone, regardless of age or ability, so please join us. There's one way you can help right now. We're collecting information about environmental resources in the area--recycling collection sites, composting opportunities, renewable energy initiatives, etc. Send any information you have to Bobbie Nunez . Thanks for helping! Evicted by Matthew Desmond made Bill Gates' list of 5 books you should read right now. "Desmond has written a brilliant portrait of Americans living in poverty. He gave me a better sense of what it is like to be poor in this country than anything else I have read." Join us on February 5th at 7:30 in the drawing room for our discussion of this important book. Lent Starts Early This Year! Ash Wednesday is also Valentines Day! 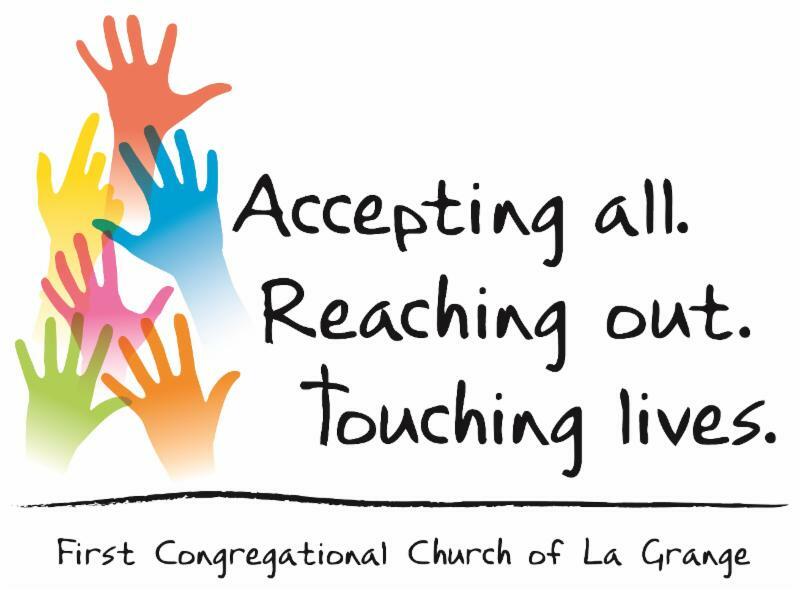 Pastor Carly will be offering ashes to friends and neighbors who commute at the La Grange Road Metra Station from 5:55 to 8:10 a.m. We will have a time of quiet mediation and reflection available to all between 3:00 and 7 p.m. in the Chapel. Our next scheduled meeting will be on Monday, February 12 . We meet every Monday except for the first Monday of the month. Feel free to drop in anytime and join us at 7 pm in the family room off the Chapel. Because of winter weather cancellations, please call Linda Lauterbach (352-5332) or email to confirm we are meeting. Winter is a great time for charity knitting! Think you're smart, or at least have smart friends? Put it to the test at another FCCLG Trivia Night. Join us on Saturday, March 10 for a night of fun and laughs, as we put all your knowledge to the test. Doors open at 7 and the questions begin at 7:30. Each team can have up to 10 players. Gather nine friends or come alone and join a team on the fly. Contact Mike Ries at 708-308-0426 to save your spot or table. Paper products month! During the month of February, we're collecting paper goods for the Second Baptist Food Pantry. Check the weekly ads for specials: this week, paper towels and bath tissue are on sale. Of course, any nonperishable food product is always welcome. If everyone donated just one item a month, the donation baskets would be filled! If everyone donated one item each week, the baskets would be overflowing! Many thanks to those who already contribute to this worthy local charity. C an’t Get To Sunday Services? You can watch them live Sundays at 10 a.m. on the web. Click here to see Sunday worship streamed live and past worship services as well. This ministry is brought to you by the estate of Ginny Palansky, and maintained by your gifts, offerings, and pledges. Watch FCCLG Live on your Roku Device! First Congregational Church of La Grange streams all of our Sunday worship services. You can view these live on Sunday mornings, or during the week, via the Livestream TV Roku channel, available on all Roku streaming devices for free. When you launch the Livestream channel, you will be brought to the main screen which displays featured events on Livestream. To find the FCCLG stream, use your Roku remote to scroll down to the bottom of the page to find the search feature. Search for FCCLG Sunday Worship Service. This will result in the upcoming or live event, as well as the library of past services. Choose either live or the recorded service. When you press the OK button on your remote while you have an event selected, it will load the stream or video on-demand and start playing on your TV. Do you ever wonder how the church entries, sidewalks, and parking lot are kept clear of snow? Yes, D is the correct answer. The snow is cleared and entries salted from a pool of just eight volunteers who make time amid their full-time jobs, parenting, and/or other responsibilities in the community. Typically, only two are able to come out any given snowfall. If you think you're up to helping out occasionally, please contact Erik Sander 708-557-4859 to be added to the snow-alert text distribution list. Full article . Ring 'n Sing : Children in K-8th grade are welcome. Rehearsals are from 11:15-11:45am in room 304. Treble Choir : An extension of Ring n' Sing, this ensemble is for children in 3rd grade and up. We meet right after Ring n' Sing from 11:45am-12:15pm. Music director Ryan Cox will be performing with Chicago a cappella in Love Stories . Just in time for Valentine's Day, stories and song combine to illustrate the intimacy of love through time. Featuring accomplished Chicago actors Michael Weber and Karen Janes Woditsch. For more info on performance dates and venues, click here. Singing in the Chancel Choir during Holy Week is a powerful experience and helps the choir and congregation alike. It truly is a gift where you can receive as well. Rehearsals will begin on Thursday, February 15 at 7:30 for Palm Sunday, Maundy Thursday, and Easter (3/25, 3/29 and 4/1). Chancel Choir Survey: Love to sing, but being a part of the Chancel Choir hasn’t worked out? Maybe it’s the rehearsal night, or your work schedule fluctuates, or maybe you like to sing a certain kind of music, or none of the above. Ryan would love to hear from you how he can help you become part of the music ministry. Who: All are welcome! Those younger than 6th grade must have an adult with them. When: February 24 th meeting at 7 am. Please let Sylvia know if you will be going and how many friends you will be bringing by February 11 th. Payment and paperwork due by February 18th. ﻿What is needed: a copy of Grand Geneva’s Release of Liability Form and the Rental Form signed for each participant and payment, before the trip. Those 6th-12th grade and not accompanied by an adult must turn in a permission slip. Please call the church office for rental forms. We need to pay with one check and turn in all the forms at the same time. If you are paying by check, please make it out to First Congregational Church. "Youth Awakening: Faith and Social Witness in 2018" will be a gathering of UCC High School students. February 25, 2018 4 pm to 8 pm on the Elmhurst College campus. Rally, music, games, food, and closing time of reflection. More information here. Messy Church will be on Sunday, March 5th at 4:30 pm. Our theme is Love Rules! Come and have a great time and grow in faith and in your love of others on the journey. Click here for flyer. We need volunteers! The annual Zackley Work Trip is March 24th-April 1st ! We will be going to Edisto Island but to make this trip happen this year, we need help! We need safe church trained people to go on the trip but also people to help organize logistics for the trip and to help with stock sales! Please let Sylvia know if you are willing to help out this year! Jeffrey Arnold, as he recovers. Fred Bell, who is recovering from leukemia. The family and friends of Marjorie Duhatschek, who died on December 28 th . Karl Fresa at the loss of his uncle. Prayers for Jane Heil to gain strength and comfort. Prayers for Barbara Hultman as she recovers from hip surgery. Dayne Hultman, Barbara Hultman’s grandson, who is recovering from a collapsed lung. Renee Meier, who is dealing with cancer. Adrienne O’Toole, as she heals after having a liver transplant. Prayers for Tom Pitman, who is living with cancer and recovering from broken ribs. Prayers for Steve Roper, as he recovers from open heart surgery. Prayers for Mike Tobin as he recovers from cancer surgery. Prayers of gratitude from Nancy Coleman’s friend Sharon Veltre, who is now in remission. For Vera Weiss to regain her strength and fight cancer.